A few posts back I decried the current state of Igbo music, with its lack of true musicianship and over-reliance on synthesizers and drum machines, singling out for special scorn recent recordings by Morocco Maduka. Reader/listener Tom Aernaert in Belgium promised us some vintage recordings by the great Maduka, and he's followed through. Maduka, who I understand hails from Awka in Anambra state, is one of the great traditional Igbo praise-singers, taking his place beside such eminences as Area Scatter, Show Promoter, and Chief Akunwafor Ezigbo Obiligbo. Obioma Special (Sammy Sparkle All Stars SSAS 011, 1981) is the sort of album that made me fall in love with Igbo traditional music. It's all here: the traditional percussion (nary a synthesizer in earshot! ), the brilliant interplay of the call-and-response vocals and the lyrics touching on contemporary concerns. Of course, there's the usual obsequious praise-singing, but that's par for the course. One thing I find quite unusual about Obioma Special is the use of talking-drum, something I've never heard in any other Igbo recording. Did there just happen to be a Yoruba musician hanging around the studio the day the recording was made, who was invited to join in? "Obioma Special" is a song in honor of the Obioma Social Club, one of the many fraternal societies that arose in Igboland following the Biafra war. These social clubs, comprised of the upper crust of Igbo society, undertake various charitable and civic works such as financing schools and building hospitals. Maduka recites the motto of the Club, "Honesty, Love and Unity," and lists the various officers. The chorus, "Uwa Amaka Nma," means "The World is Beautiful." "Abortion Special" concerns a debate in Parliament regarding the subject of abortion. It is stated that there is a problem with young girls getting pregnant out of wedlock and resorting to the practice. How is this problem to be addressed? Maduka does not take a stand for or against abortion, although it is frowned on in traditional society and is generally illegal under Nigerian law, except to save the life of the mother. The chorus, "Agboyi Atulu Ime," means "a young girl gets pregnant." "Awka Leaders of Thought" sings the praises of various notables ("Ndi Eze") in Maduka's home town. Thanks once again to my wife Priscilla for interpreting the lyrics of these songs. In Ronnie Graham's Stern's Guide to Contemporary African Music (Zwan Publications, 1988, published in the U.S. as The Da Capo Guide to African Music), there is an intriguing reference to something called "Igbo Blues," which he defines as ". . . basically a percussion arrangement supported by vocals and lacking even guitars. . ."
What Ronnie calls "Igbo Blues" would probably be more properly labeled Igbo Traditional or Igbo Roots Music, and this is an extremely popular and variegated genre in the Nigerian music industry, encompassing myriad styles and artists. I've never actually seen a recording labeled "Igbo Blues," although the appellations "Igbo Native Blues" or "Igbo Native Music" are sometimes used. 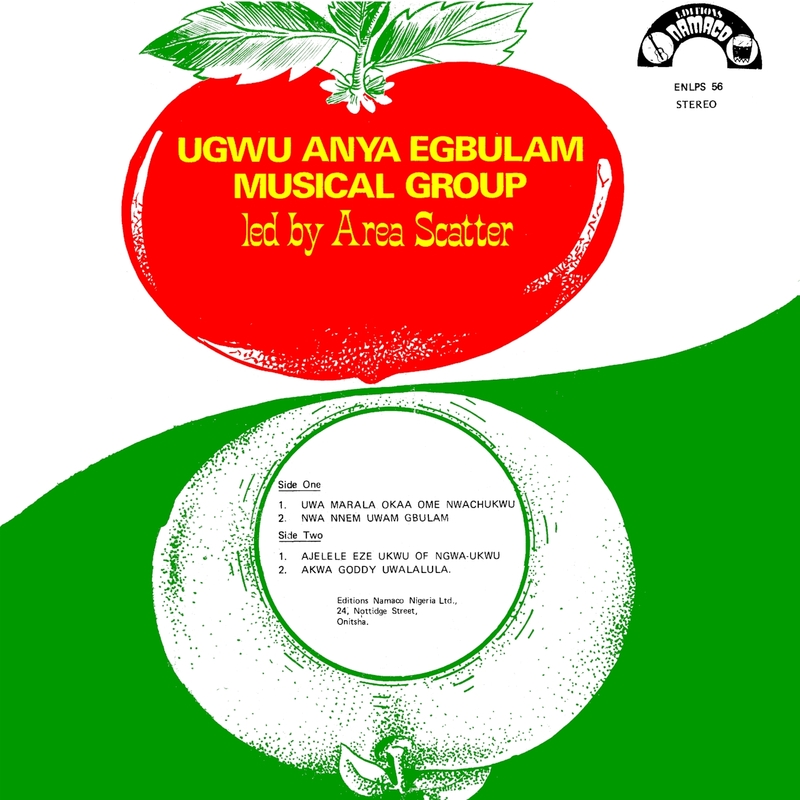 Below are two record labels featuring the former term, the first from Ogbogu Okoriji & his Anioma Brothers, a percussion and vocal ensemble from Delta State, the second by the fifty-member women's dance and vocal group group of the Nnewi Improvement Union (Lagos Branch). I've also seen "Igbo Native Blues" applied to solo pieces for ubo (Igbo thumb-piano) and voice, and also to straightforward Igbo guitar highlife, so who's to say what it really means? Another popular version of Igbo traditional music is performed by amateur and semi-professional percussion and dance troupes. Around Christmastime or during village celebrations, such as the Iri Ji, or New Yam festival, these groups are ubiquitous in Ala Igbo, traveling from house to house and compound to compound to perform for money. 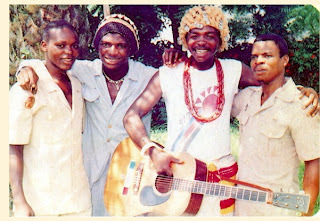 During my first visit to Nigeria in December 1994 I made a number of videos of groups such as these, which I really should post on YouTube some day. 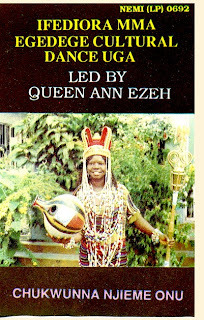 From the cassette Chukwunna Njieme Onu (EMI Nigeria NEMI 0692), here is a tune by the Ifediora Mma Egedege Cultural Dance Group of Uga, which is a noteworthy examplar of this style. Here the full panoply of Igbo traditional instruments is displayed to great effect. The amiri (reed flute) leads off, to be joined in succession by the ekwe (wooden slit drum), ogene (two-headed bell) and oyo (rattle). The title, "Chukwunna Njieme Onu," means "My God that I Brag About." Lead singer Ann Ezeh addresses God in a very personal way: "God, please bless us, God that we rejoice in, God give us your grace, God that is all-good, God in heaven ('Olisa din'igwe') make our way easier." One of the outstanding Nigerian releases of the 1980s was Anti-Concord/Apama (Nigerphone NXLP 011, 1988) by Ibealaoke Chukwukeziri & his Anaedonu (right). Side 1 featured sparkling guitar highlife, while side 2 was devoted to some great Igbo cultural roots music, including this song, "Apama," or "carry me," which addresses the burning issue of Igbo women not being as tall as they used to be! You can see a video of it here. 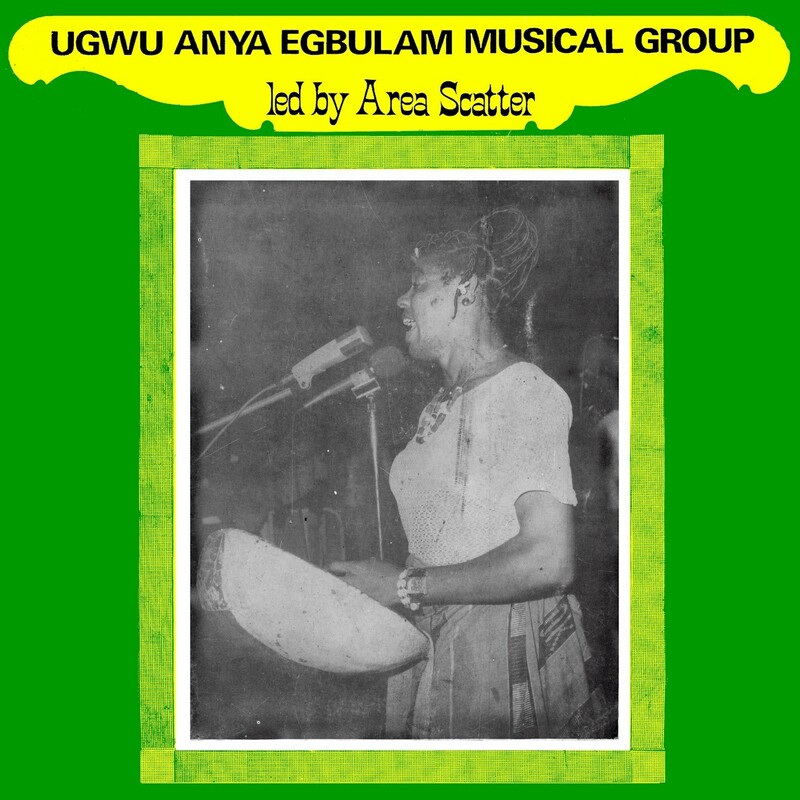 Finally, any discussion of Igbo roots music would be incomplete without an example of women's choral music. 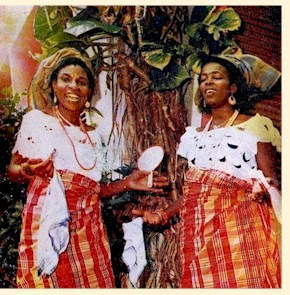 There are literally thousands and thousands of Igbo female singing groups throughout Nigeria, and many have made recordings. 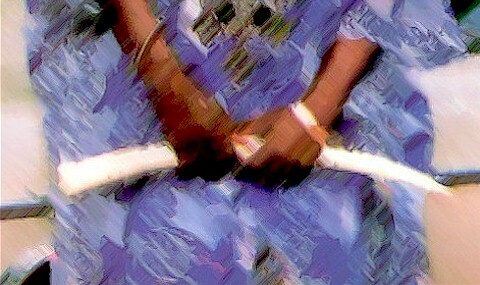 One of the more popular ensembles in the '80s was the Okwuamara Women's Dance Group of Umuoforolo, Nkwerre in Imo State. "Nkwerre Imenyi Anyi Abiala" is from their LP Okwuamara '88 (SIL 001), and serves as an introduction to the group: "Nkwerre Imenyi [the group's home village], we have come, the beautiful ones have come." The chorus then replies "yes, we have come." Greetings are then given to the people of Nigeria, of Imo State, etc., etc. Thanks once again to my wife, Priscilla, for interpreting the lyrics. Please let me know if you've enjoyed these tracks. I have tons of music like this, and I'd love to make it better known. I like to give "shout-outs" to other African music sites whenever I can, and it occurred to me yesterday that I've never mentioned Matt Yanchyshin's excellent blog Ben Loxo du Taccu. This was the first serious African music blog, and it's been the inspiration for many others. If you're reading this, you've probably seen Ben Loxo already. If you haven't, though, do yourself a favor and drop by now. It's an excellent way to find out about and sample the latest sounds out of Africa. It's "Eritrea Week" at Ben Loxo right now, and Matt's got a platterful of musical treats from that country for your listening enjoyment. I'm indebted to Matt in a number of ways. Not only did he directly inspire this blog, he personally advised me on some of the technical issues involved, and has been generous in his praise and encouragement ever since.